Most would agree that timely recanalization is an important to maximize recovery during acute stroke. This is the goal of t-PA, and we need an adjunctive therapy to improve its efficacy. Sono-thrombolysis is an intriguing alternative, because it is non-invasive, performed at the bedside and provides no radiation exposure. A problem in administration is that it can be technically difficult and operator dependent, requiring the skill of a technician that may not be available 24-7. This is the rationale of the CLOTBUST hands-free device which is operator independent and provides 2 hours of exposure to ultrasound waves. In this article, Barreto et al. demonstrate that the hands free device is safe in the 20 participants tested (intracranial hemorrhage is the endpoint). Participants presented as an acute stroke and received IV-tPA. They had a demonstrated large vessel occlusion by either TCD or CT angiogram (MCA, ICA or vertebral). The device was placed after the t-PA bolus was administered and left on for 2 hours. At the end of the therapy, subjects underwent repeat TCD or CTa to determine recanalization by TIBI criteria. One subject did have a symptomatic ICH, however that was attributed to endocarditis and not the study device. Recannalization rates were similar to historical controls in the t-PA group. It is not surprising that this technology is safe. Early recanalization does carry a risk of hemorrhage, but also the greatest potential for benefit for recovery. This technology can be delivered rapidly and upon presentation to the emergency department. We are still left with the question; does it work to improve outcomes in stroke patients? We will have to wait for the next phase to find out. Traditional Chinese medicine (TCM) is used extensively in Asia to help recovery after stroke. MLC601, marketed as NeuroAiD® is one such TCM which combines extracts from 9 plant and 5 animal components. The CHIMES study was recently published in Stroke. It was a placebo-controlled randomized trial of patients with acute, moderately-severe ischemic stroke (NIHSS 6-14) treated with NeuroAiD® within 72 hours for 3 months, in addition to standard treatment. NeuroAiD® was no better than placebo in improving outcomes (mRS). Chen and colleagues did a post-hoc analysis of CHIMES looking at early vascular events. At 3 months, the composite endpoint consisting of nonfatal recurrent stroke, nonfatal acute coronary event or vascular death was significantly lesser in NeuroAiD® treated patients. Although not reaching statistical significance, the number of events within each endpoint subgroup was also lesser in the NeuroAiD® group. Mechanism of action is not understood, but does not seem to be related to antiplatelet, lipid or blood pressure modifying effects. Authors postulate that ATP-dependent potassium channel activation may provide myocardial and cerebral preconditioning and hence chronic cyto-protection. Herbal remedies are used as first line treatments for all illnesses in an estimated 80% of the world’s population and some have good clinical evidence. In neurological disease for instance, butterbur extract now has Level A evidence for treating migraine. For believers in complimentary and alternative medicine, NeuroAiD® offers promising potential. If an add-on therapy safely reduces vascular events post stroke in addition to improving functional independence and motor recovery, that is a huge plus. The safety profile of NeuroAiD® appears acceptable so far. Further studies of course are needed to confirm effects. We continue the search to improve on secondary stroke prevention. CHANCE was a recent “positive” secondary prevention trial in a Chinese population. Hope the future editions of CHIMES enjoy similar success. Improved detection of silent atrial fibrillation using 72 hours Holter ECG in patients with ischemic stroke. Roughly, 800,000 people in the United States suffer stroke every year. About 600,000 of these are first attacks, and 200,000 are recurrent attacks. More than 140,000 people die each year from stroke in the United States. Stroke death rate fell ~30% and the actual number of stroke deaths declined ~14% from 1995-2000, thanks to the outstanding efforts medical community on increased stroke awareness, primary and secondary stroke prevention. But can we do better? I like this study, because it is simple and well executed. 1135 patients was enrolled in 9 German secondary and tertiary stroke centers between May 2010 and January 2011. All enrolled patients suffered stroke or TIA. 72 hour ECG monitoring was performed after patients with known A-Fib and patients with newly diagnosed A-Fib were excluded. Stroke mimics were excluded as well. Patients were monitored for the paroxysmal A-Fib 2 days longer than what standard of practice is. In 49/1135 patients (4.3%, 95%CI 3.4–5.2%) A-Fib was diagnosed, 29 patients (2.6%) within the first 24 hours of monitoring, and in 20 further (remaining 1.7%) patients during 25-72 hour monitoring. The number needed to screen by 72 hour ECG was 38 patients (95%CI 26-50) for each additional A-Fib diagnosis. Patients with unknown A-Fib were significantly older and had more often a history of prior stroke. Interestingly, the affected vascular territories were not different, nor were multiple infarctions more common in either group. Question remains: Is it beneficial to anticoagulate everybody with paroxysmal A-Fib. Should everybody be offered prolonged Holter monitoring? Should we select the population more likely to give us positive result; patients over 65 years? Is 3 days enough? Should we extend it to 7 days….or more? Can we switch to telemetry monitors instead of frequently present cardiac monitors (often unable to review) in the stroke units and incorporate prolonged EKG in all admitted stroke and TIA patients? All of these questions need to be answered in subsequent trials, but this article just confirms my current practice. I am more and more inclined to offer prolonged EKG (7 days) to the patient over 65 and selected patients below 65. When A-Fib is confirmed and after calculating CHADS2 score (most of them start with at least 2 points for stroke or TIA), I offer them anticoagulation. The burden to accurately predict stroke increasingly falls upon the paramedics who first respond and decide if a patient needs to be re-routed to a specialty (certified) stroke center. The traditional and widely used FAST score is easy, with its acronym prompts — deficit in Face, Arm, or Speech? However, FAST was criticized for missing 38% of posterior fossa strokes. 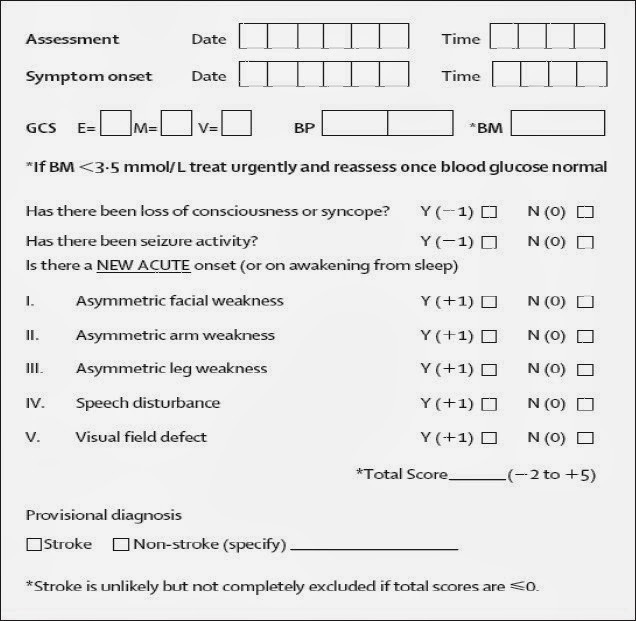 The developers of FAST came out with the ROSIER score, which adds to FAST questions about vision and leg weakness and takes off points if there is seizure or syncope at presentation. In a prior study, ROSIER outperformed FAST in the emergency department in picking up more strokes and reducing non-stroke referrals to specialists. The current study, however, found that the ROSIER score was no better than FAST in the pre-hospital setting in the UK. the pre-hospital or emergency setting. What do you, the ER, or your paramedics use to recognize stroke/TIA? In this study, a regression analysis identified the best predictors of stroke as face or arm weakness, or (absence of) seizure activity. Maybe the FAST + a question about seizure activity would improve sensitivity of stroke identification. The evidence supporting the association between statins and intracranial hemorrhage (ICH) is contradictory. Woo et al. hypothesized that one explanation for this is unmeasured confounding variables. These include hypercholesterolemia (HC) and ApoE genotypes. According to prior studies, HC is inversely related to the risk of ICH, and Apolipoprotein (Apo) E2 and ApoE4 are associated with a higher risk of lobar ICH compared with the more common E3 allele (wild type). Armed with these facts, the authors hypothesized that an unstudied interaction between ApoE/statin or ApoE/HC may have confounded the impact of statins on ICH. For this reason they sought to determine if a possible interaction exists between HC, statin use, and ApoE genotypes. Their prospectively designed case-control study revealed that (1) having a history of HC was associated with decreased risk of lobar ICH, in both statin and non-statin users; (2) a history of HC did not appear to modify the association of either ApoE2 or ApoE4 with lobar ICH; and (3) Statins were associated with an increased risk of lobar ICH in patients with Apo E4/E4, and Apo E2/E4, as compared to Apo E3/E3 controls, but not in non-lobar hemorrhage. The findings were validated in a separate population, which adds to the strength and credibility of the study. Unfortunately, the sample size decreased when patients were stratified based on their ApoE genotypes, and as a result only a trend between statin use and Apo E2/E4 and E4/E4 was observed on formal testing for the interaction. The authors concluded that if their findings are confirmed by future studies, there may be a rationale for genetic testing in lobar ICH patients who are on or are being considered for statin therapy. Based on the data presented, the authors might have engaged in further speculation. Some physicians are concerned about statin use in the setting of non-lobar hemorrhage, such as those that occur in the setting of uncontrolled hypertension. The results of this study did not show an association between non-lobar ICH and statin use, regardless of ApoE genotype. Therefore, such patients would benefit best from optimal medical management, including control of hypercholesterolemia. Changing clinical practice, eg, stopping statins in patients with non-lobar hemorrhages, is not evidence-based and at this point may disallow patients from receiving the benefits of statin therapy. In 2011 the Stenting versus Aggressive Medical Therapy for Intracranial Arterial Stenosis (SAMMPRIS) trial was halted early by their Safety Monitoring Board because of an increase in the 30-day stroke and death rate from 5.8% in the medical management group to 14.7% in the endovascular treatment group. This dramatic result almost immediately changed clinical management for thousands of patients with severe intracranial atherosclerosis. Many, though, were quick to criticize the SAMMPRIS results for a variety of familiar reasons (operator experience, type of stent, case volume, etc.). This study by Farhan Siddiq et al. looks at 3,447 patients from 2008-2010 in the Nationwide Inpatient Sample with cerebral ischemic events treated with intracranial stenting as part of a clinical trial (CT) or outside a clinical trial (OCT). 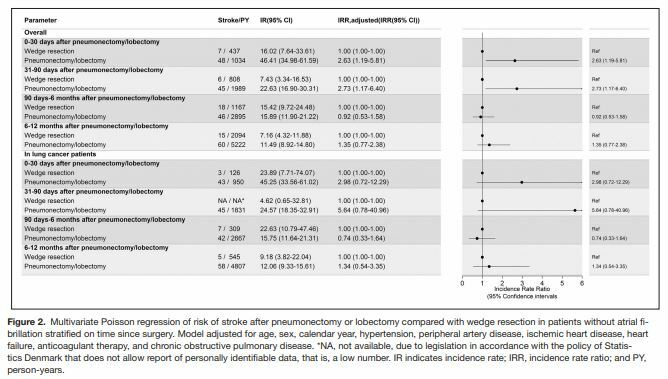 The 223/3,447 (6.5%) patients in a CT had a composite endpoint (post-operative stroke, cardiac complications and mortality) of 4.5% versus 14.2% for OCT patients. 76.8% of the CT patients were discharged home while only 49.6% of the OCT patients were. Assuming that the ICD coding that the study used to identify patients is reliable, the results suggest several conclusions. The first is that the CT patients were probably “cherry-picked” to some degree, a phenomenon that is evident in many clinical trials, including the seminal ones addressing carotid stenting. The second is that the results of SAMMPRIS appear even more robust based on this data and a major advance in stent technology or endovascular technique would be required before re-addressing the utility of intracranial stenting. Yang et al. compare in this article intravenous (IV) versus intrarterial (IA) administration of autologous bone marrow mononuclear cells (MNCs) in a rat model of transient middle cerebral artery occlusion. In this study, rats received either low dose or high dose MNCs, after stroke lesion, either through IV or IA administration. Neurologic outcomes, serum cytokines and neuropathology techniques were used to compare the routes of administration. They found that IA delivery was not superior to IV at most endpoints. For example, lesion size was reduced in rats receiving high dose MNCs, and did not matter if therapy was received IA or IV. This is provocative work; in that it demonstrates with systemic administration of MNCs, there may be adequate entry into the brain. IV administration is much more practical than IA in the clinical setting. The idea that autologous stem cells will “hone in” on damaged brain tissue after bypassing the lungs and the rest of the systemic circulation is remarkable. 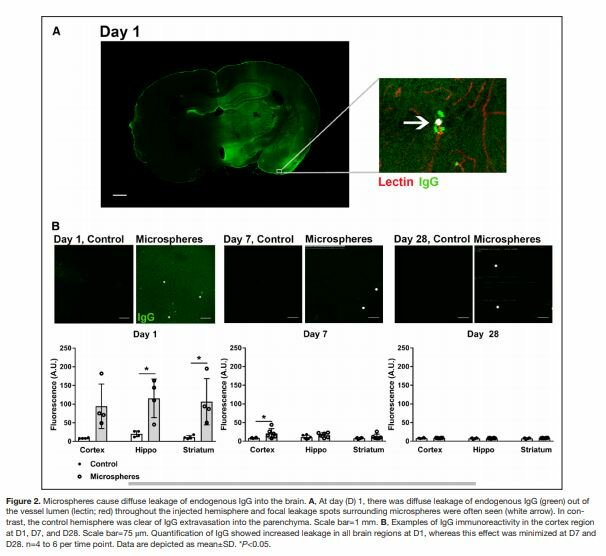 I for one am amazed that the cells are even able to get to the target damaged brain tissue. I would like to better understand the hypothesis as to how they will help in network repair and functional recovery after they arrive. Would delivering cytokines and growth factors to the damaged brain have the same effect, or is there an integrative function that the cells play themselves? Either way, the idea of a new high technology therapy for stroke recovery is appealing, and we will continue to watch. In this very interesting study, Nakagawa and colleagues explored who is more likely to get an early DNR status (within 24h after the admission) after ICH. Data was retrospectively acquired for the ICH patients in the tertiary stroke center over the period of 4 years. 396 patients were identified with ICH, however 24 had preexisting DNR and were excluded from the study. Even in this population, women were more likely to have preexisting DNR. 372 patients were studied. Women were more likely to receive an early DNR order compared to men (OR 2.24, 95% CI 1.36 to 3.70) in unadjusted analysis and also in multivariable analysis (OR 3.18, 95% CI 1.51 to 6.70). Also, higher age (OR 1.09 per year, 95% CI 1.05 to 1.12), larger ICH volume (OR 1.01 per cm3, 95% CI 1.01 to 1.02), and lower initial GCS score (OR 0.76 per point, 95% CI 0.69 to 0.84) were also independently associated with early DNR orders as one would expect. This data is interesting from two angles. First is why women have more frequent preexisting DNR. Do women themselves wish to have less aggressive management when faced with catastrophic illness such as ICH, leading to cardiopulmonary arrest? Second, once they have ICH, surrogate decision-maker makes decision on the DNR status. It would be really interesting to further explore what are the factors influencing these discrepancies. Mexican Americans have higher stroke rates than non-Hispanic whites, but the reasons for this disparity remain unclear. Levine and colleagues sought to determine if lack of treatment for HTN prior to stroke among Mexican Americans might explain this difference after adjusting for socioeconomic status (SES) and acculturation. The authors used data from the Brain Attack Surveillance in Corpus Christi project (BASIC) to retrospectively determine whether patients admitted to the hospital with a diagnosis of stroke took anti-HTN medications prior to admission. They compared the use of anti-HTN medications between Mexican Americans and non-Hispanic whites and then adjusted this comparison based on education level (as a proxy for SES) and English proficiency (as a proxy for acculturation). The results showed no difference between use of anti-HTN medications among Mexican Americans and non-Hispanic whites even after adjusting for SES and acculturation. The only factor which contributed to the level of pre-stroke anti-HTN use was whether or not patients had health insurance. 93% of the Mexican American patients in this study were insured, which may explain the overall negative results. Interestingly, both Mexican Americans and non-Hispanic whites of higher SES demonstrated a trend toward lower anti-HTN use. It remains unclear whether the results from this study are generalizable to other Mexican American populations. If so, the authors have ruled out one more possible explanation for the high stroke rates among Mexican Americans. Hou Q, Zuo Z, Michel P, Zhang Y, Eskandari A, Man F, et al. Influence of Chronic Hyperglycemia on Cerebral MicrovascularRemodeling: An In Vivo Study Using Perfusion Computed Tomography inAcute Ischemic Stroke Patients. Stroke. 2013. Wintermark and colleagues investigated the use of CT Perfusion (CTP) for assessment of cerebral microvascular remodeling in chronic hyperglycemic patients who presented with acute stroke. 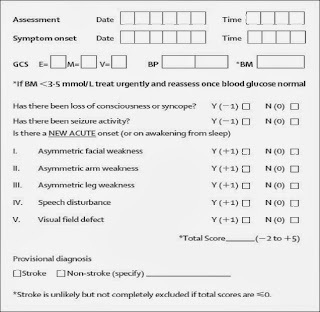 In this small retrospective analysis of 26 patients, authors suggest that Mean Transit Time (MTT) may be used as a marker for exposure to long-term hyperglycemia and subsequent cerebral microvascular remodeling based on the finding of prolonged MTT in non-ischemic cerebral hemisphere of patients with glycated hemoglobin (HbA1c) >6.5. While this is an interesting finding, I would approach the results with caution. The analysis included very small number of patients and patients in hyperglycemic group had more severe elevation of blood pressure (this almost reached statistical significance, p=0.06). Acute phase of stroke is a very dynamic process and any change in hemodynamic state, which may be quite short lasting, may alter the results of CTP. For this reason, although it is likely that microvascular remodeling does occur as a consequence of chronic hyperglycemia, I think that any marker studying this effect (including CTP) should be studied in a more stable, chronic clinical setting rather than during acute phase of stroke. As the authors suggested, a larger trial is necessary to answer this question and I will be looking forward to such a trial.